Ed undertook a capacious and engaging marketing campaign for the Tremains Affordable Art Exhibition (TAAE), which was held at Napier Girls’ High School (NGHS) Friday 9 – Sunday 11 March 2018. 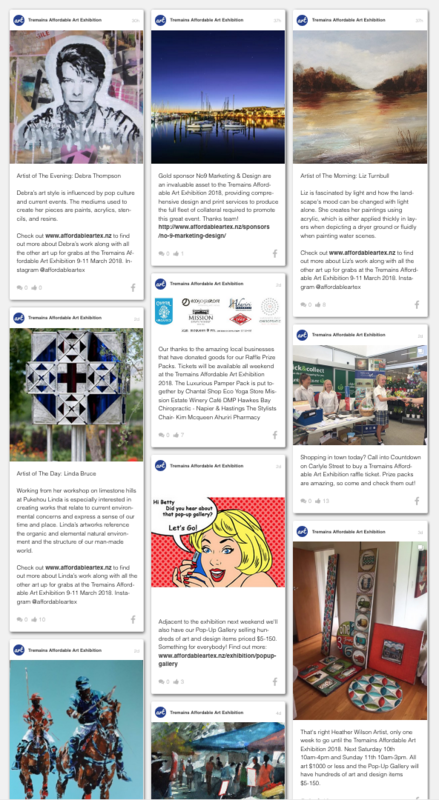 From website development to social media, signage and print collateral distribution to PR and communications: Ed pulled out all the stops promoting this significant community event. Outdoor signage was designed and positioned for maximum attention and exposure to the event. The TAAE is an exciting annual fundraising event for NGHS. It features over 300 artworks by more than 80 professional artists from around New Zealand. With every piece priced at $1000 or less, it provides an opportunity for art lovers in the Hawke’s Bay community to start a new art collection or add to an existing one. Since its inception in 2015, the event has raised over $75,000 for the school. Ed’s objective in 2018 was to market the pants off the TAAE, to see that figure rocket. For NGHS, the TAAE is an extremely valuable fundraiser. Money raised is used to fund initiatives to support students to make well-informed health and well-being choices, such as self-defence classes and speaker evenings about important teenage health and self-care topics like resilience and leadership. The more funds raised, the more initiatives can be implemented. And there’s another important benefit: the NGHS students involved in the exhibition itself gain real-world skills related to running an event, time and task management, and specific skills such as managing website content, rolling out social media campaigns and how to distribute print collateral so it appears in front of target audiences. The Opening Night Gala saw a record number of attendees (300+) with two thirds of all art sold occurring at this event. Hawke’s Bay’s leading real estate company Tremains and local real estate agent Sarah Pinckney-Welch recently came on-board as joint platinum naming sponsors for the TAAE for the next three years (at least). Tremains are passionate about supporting events that benefit the local community and having daughters attend the school in the past and present, the partnership seemed the perfect fit of shared values and principles. Gold sponsors include: Gemco, Somerset Smith Partners, BDO Hawke’s Bay, No.9 Marketing & Design and Printing.com. Silver sponsors are Sacred Hill and Bennett & Pearson Optometrists. Event partners are Ed, Sitetools, Eventfinda and Branded. Tremains and local real estate agent Sarah Pinckney-Welch are joint platinum sponsors. The committee of parents and students that organise the TAAE resolved that for 2018, a more comprehensive marketing push to drive ticket, exhibition and gallery sales would improve event results and increase the funds raised. And they decided to utilise Ed’s expertise to do just that. The hero of this story – Ed – is a Hawke’s Bay-based brand, marketing and communications agency. Ed provides the full suite of marketing services to businesses and organisations of all shapes and sizes. And the man behind Ed, Stefan Olsen, also runs all marketing and communications for the TAAE. A top-down approach was adopted to develop and direct a compelling and effective marketing strategy. After considering the committee’s goals and objectives, Ed deployed tailored marketing tactics for digital and traditional channels to capitalise on promotional opportunities for the event. Ed has also become the brand guardian and central ambassador for the TAAE, ensuring all collateral is created, applied and delivered in a consistent, memorable and persuasive manner for maximum target audience uptake. A comprehensive three-month social media campaign was central to marketing and communications. With enhanced messaging and reworked branding, Ed weighed up promotional tactics and developed a comprehensive strategy for the timing, placement, format and acute targeting of audiences in all event communications. Throughout the execution of the strategy, Ed ensured continuity in visual and key messaging; vigorously spreading the TAAE’s ethos and spirit. At all stages, Stefan has also worked hard to keep all the players informed. After evaluating the TAAE committee’s suggestions and expectations, Ed designed and managed the development of a new website – assessing five local website developers against their ability to meet specifications for design, functionality, user experience and ultimately results. Ed took charge of designing the new site and writing the scope, briefing the developer, managing the build, then streamlining and troubleshooting post go-live. The final product is an intuitive, clean site with clear brand messaging and navigation. Ed manages ongoing content updates to the new site, including adding artist profiles and examples of their work. A new website that is intuitive, clean and has clear brand messaging and navigation was designed and developed. While Ed developed copy, supplied images and logos, and specified adjustments to existing collateral, No9 Marketing & Design assisted with purpose-designed collateral to perform in print. Once materials had been printed, Ed arranged distribution across multiple channels by utlising NGHS students and various contacts within the Hawke’s Bay event and marketing sectors. Ed also scouted and obtained access to an array of stand-out sites to install outdoor signs and posters, negotiating with council and a fleet of landowners for access and permissions. 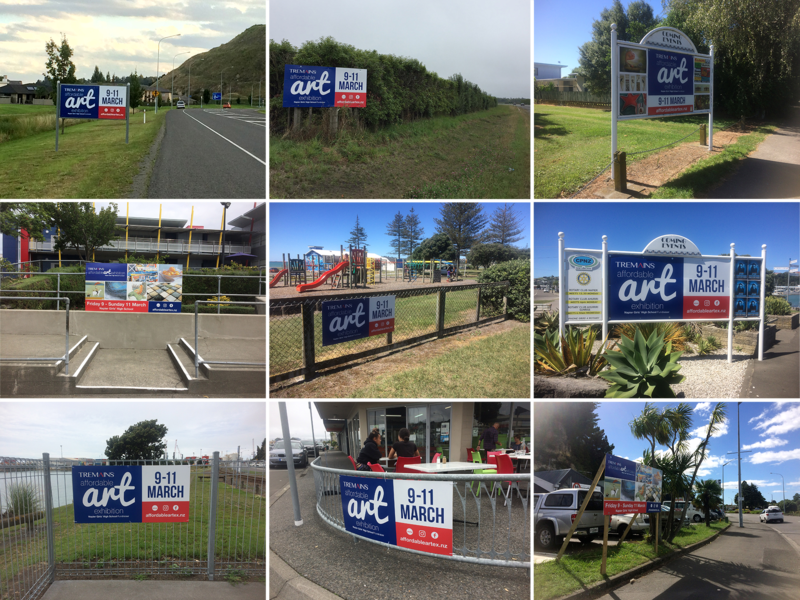 Outdoor sign sites were scouted and access / permissions were negotiated with council and landowners. The new website provides visitors with bios and mini galleries of exhibiting artists prior to the exhibition. Ed worked with NGHS students developing content then scheduling and publishing frequent posts in a comprehensive TAAE social media campaign on Facebook and Instagram. Alongside student reps Ed managed social media activity calendars for the artists, sponsors, Pop-Up Gallery and raffle, and also assigned tasks to prefects and other participating NGHS students, and committee members. 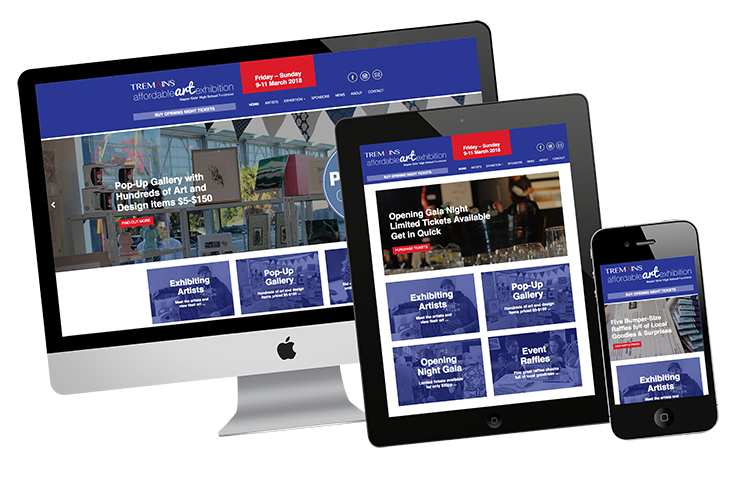 Local and nationwide exposure was ensured on online event hotspots such as Eventfinda, the Hawke’s Bay Tourism website, and the Hawke’s Bay business site Great Things Grow Here. And of course, the dedicated TAAE website features artists, event details and many other updates about the event. 300 tickets to the Opening Night Gala sold out two weeks before the event with a waiting list of 30. As a true public relations ambassador for the TAAE, Ed arranged and enthusiastically undertook promotions with newspaper and radio, and targeted communications with previous buyers, staff, parents, local businesses and sponsors. Ed has also been a wizard with ticketing: managing the Eventfinda listing, integrating ticket purchasing with the website, manual ticketing and issuing complimentary tickets. Google Analytics results show a steady increase in website visitors and a profound burst leading up to the exhibition. From planning, coordinating and managing communications, distributing collateral, writing and disseminating PR and media, to managing social media and ticketing, assigning tasks and administering the advertising budget – Ed was on top of it all. Two weeks out from the event, gala opening night tickets officially sold out. And the exhibition over the weekend 9-11 March was a huge success, breaking all past records to raise over $32,000 for health and well-being initiatives at Napier Girls’ High School. So, if you’re looking for a comprehensive marketing plan and the means to deliver it with measurable results, call Ed for a chat. Two weeks out from the event, Opening Gala Night tickets officially sold out.